A Family Portrait Sitting and Souvenir print for just £25 ! Now is the time for a family portrait. Christmas will be with us before we can say “smile please” and wouldn’t portraits be just perfect to give as presents? You’ll enjoy a fun photo shoot at our studio for up to six people (there will be a small surcharge on this deal for larger groups). 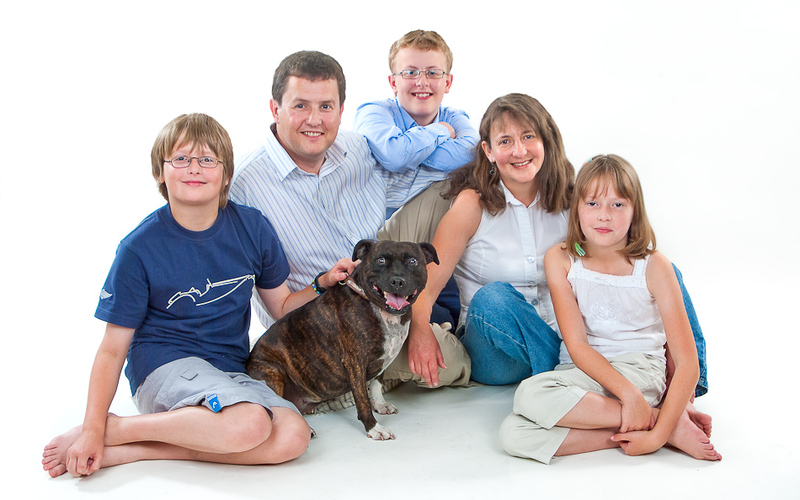 We will photograph you all together, individually, just the children, just Mum and Dad – in fact any combination you would like to see. And don’t forget to include the family dog in the equation too! We don’t charge per shot and there is no obligation to buy one of everything!. The price of a family sitting is normally £45 and the souvenir print has a nominal value of £35 that can be put toward the cost of a larger framed portrait if you so wish. Nab it now for just a tenner deposit and pay the balance of the deal price when you book the appointment. One voucher per person/household, additional may be purchased as gifts. Voucher is valid for two months and may not be used with any other offer or promotion.